Shopping for a special occasion could become an ordeal. You browse from one store to the next, and while you see several options, it is impossible to pick one. Recently, a friend of mine ordered her bridal dress online, from Aisle Style. It looked beautiful and fitted her perfectly. I had never thought of browsing for clothes online particularly for special occasions such as weddings. As another friend’s homecoming approached, we began looking for a dress on Aisle Style, which delivers worldwide. We found over a thousand designs that ranged from wedding dresses to homecoming dresses. The best part was that unlike a store, all the dresses were modelled which helped us judge what a dress would look like on her. We liked a few designs from their prom dresses collection, and within a few hours, she had chosen her outfit. The process of selecting, buying and shipping was like any other online store. The overall experience was so satisfactory that my friend decided to buy a few dresses for weddings as some of the collection was on a 50% discount and she was getting a good bargain. Of course, there are some limitations when it comes to online shopping. For example, it is hard to choose the colour over a computer screen, so what I really liked about Aisle Style is that they offered a fabric swatch option. If you are a bride looking for a wedding dress, or if you are ordering for a special occasion, you are encouraged to order the fabric swatch and feel the fabric and colour in real before deciding on the dress. 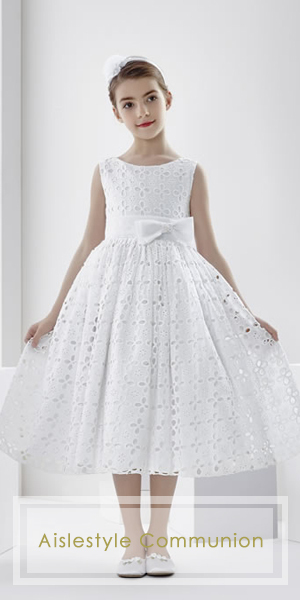 Apart from bridal, there is also a great selection of bridesmaid dresses and communion dresses. I would recommend browsing through the Bridesmaid Dresses 2017 collection for latest cuts and trends. Just go in with an open mind and you might be surprised like my friend and I. Happy shopping! Previous Entry What Does Being A Woman Mean To You?